What type of anesthesia is best when operating on cat bite injuries? Would an Oberst block suffice? So when is it not recommendable to perform a plexus block when looking at an animal bite injury? What type of anesthesia may be selected in a case like that? What type of anesthesia is best when operating on cat bite injuries? Would an Oberst block suffice? An Oberst block (simple finger anesthetization) requires the numbing of the nerves of the proximal phalanx. 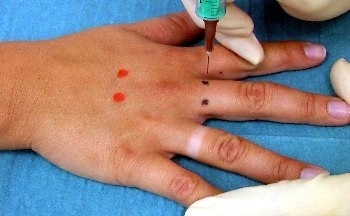 This anesthesia method may only be applied as long as the bite wound is not infected yet and confined to the distal or proximal interphalangeal joint of the finger. Under no circumstances may this method be chosen if there is evidence for propagation of the infection, as an injection of anesthetic agent into the proximal phalanx would then bear the potential risk of spreading the germs deeper into the hand. An Oberst Block as seen in this picture is almost never suitable when dealing with an infection caused by a cat bite injury! As a result most procedures performed on animal bite injuries are being performed under plexus block. This anesthesia method requires the injection of the anesthetic agent close to the nerve network in the area of the armpit. A plexus block usually provides numbness to the entire arm within half an hour. The image shows why the application of Oberst block in connection with a cat bite injury hardly ever represents a viable option. 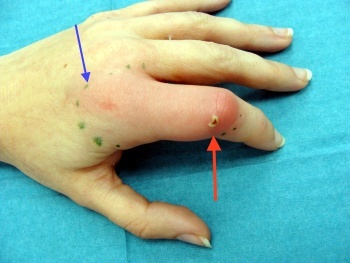 The cat bite seen on the proximal interphalangeal joint (red arrow) is only twenty-four hours old and yet the inflammation (reddening) already reaches all the way into the metacarpus. Performing an injection into the inflamed area is not an option since this would push the germs deeper into the hand! Once the infection progressed and there is evidence of reddening and swelling of the lymphatic vessels of the upper arm, plexus block is no longer possible especially, when the lymph nodes in the armpit appear swollen. Then no anesthetic agent shall be injected into the armpit. The only option left then is general anesthesia. Some patients may find this cumbersome, maybe even risky. Clearly general anesthesia bears its own risks, nonetheless the situation calls for a benefit-risk-assessment which should consider the potential risks of a hand infection along with their severe ramifications.